to play it with a fresh taste, they team up with highly talented young musicians for whom this pieces are new. This almost forgotten music persists but reappears with a new sound and groovy energy. 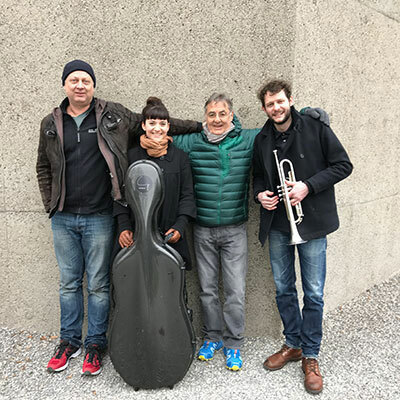 Some thirty years after initiating his „Alpensturm“ (Alpine Storm) with groups like „The Alpine Experience“ and „MYTHA“ (The Contemporary Alphorn Orchestra), Hans goes back to his other roots: Jazz, and his first love, trumpet. 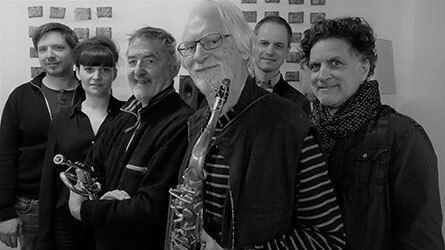 „WOOD&BRASS“ gives Hans the format to focus on his original instrument – the trumpet – still enriching the repertoire with the experience of his former projects. The instrumentation of this jazz chamber music quartet is unique: Two trumpets; one trombone; one cello and the brass double on alphorn. The cello brings the warm timbre to this ensemble, and the cellist’s voice adds exiting surprises. The quartet plays in „natural“ instead of tempered intonation (pitch) . Christine Lauterburg, Hans Kennel, Regina Steiner are GÄZIG. Their style of „New Alpine Folkmusic“ has an archaic tinge. Traditional instruments and natural yodel merge into a dense vocal web which creates authentic sounds and soulful music. 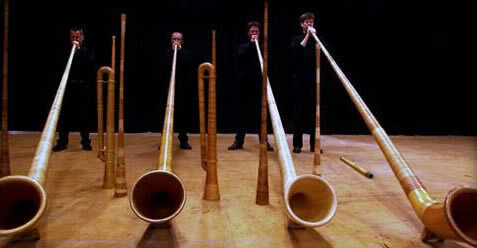 Originally this the revolutionary alphorn quartet was called The Contemporary Alphorn Orchestra. MYTHA proved to be an appealing name and this ensemble has not lost any of its original energy and it remains the relevant model group for the magnificent voices of these natural horns. MYTHA established new and still unsurpassed standards in liberating the horns from their naturally limited tonal range and emancipating them to fully valuable musical instruments and vehicles for formally unheard polyphonies. This is partly the result of using horns of different basic pitches and thus overlaying various untempered sound layers. MYTHA’s endeavor to master these instruments was accomplished in a contemporary musical consciousness. MYTHA triggered a lasting development of many followers. Alphorn playing is no longer what it was before this group’s first public appearances. A compilation of the first ever recordings of the early nineties is available since 2007 on hatOLOGY (Hans Kennel: MYTHA-How It All Started). A cooperation between MYTHA and the outstanding singer Betty Legler produced a fascinating blend of sounds. This resulted in the recording of a CD/TBC (03153) and several public appearances in Zug, Lugano, Kazakhstan (Astana, Almaty) and Cameroon.